In any trial of even the most ordinary murder, one can expect an abundance of information about the murder weapon, including a detailed description of the weapon and how it was used. Surely, with regard to murder as novel and as bestially spectacular as the alleged mass-murder of millions of Jews in gas chambers, one would be given far more information. Surely, the postwar trials involving those monstrously amazing gas chambers would provide the most extensive and precise documentation possible regarding such unconventional murder weapons. But no, that is not what one finds at all. Although there is a vast literature, based in part on those trials, including many "eyewitness accounts" and "documentaries" covering the most diverse aspects of the holocaust story, nonetheless, as far as the actual mechanics of the extermination process are concerned, about all one ever finds is an occasional short and vague description. The information gaps regarding the mechanics of the alleged extermination process should arouse the gravest suspicions. We are after all no longer in the immediate postwar era, when there would have been many valid excuses for confusion as to events which may or may not have taken place in a terrible war which had ended just recently. Almost forty years have now elapsed. The holocaust specialists have had more than enough time and opportunity to examine documents and alleged mass-murder sites as well as the testimony from the most massive trials in the entire history of the world. Throughout this period they have certainly been active, and yet they have found little. Aside from a few bits and pieces of so-called "confessions" and "eyewitness testimony," they have, in fact, found next to nothing. The information gaps are bad enough; what is far worse is that the bits and pieces of information which one does find are simply incredible. To kill people with gas is not inherently incredible since it certainly does happen, even accidentally. But if one carefully examines the available information about the German gas chambers from a scientific, medical or technical perspective, he soon realizes that he is dealing with an absurd muddle. To characterize the alleged mass-murder methodology as "harebrained," "crackpot," or simply "weird" is to understate the situation. The more one examines what little information there is, the more obvious it becomes that the people who repeat the holocaust story in one form or other really have no idea as to what they are talking or writing about. The testimony of the so-called eyewitnesses is especially weird. The Gerstein statement, which has been widely accepted by the holocaust specialists, is probably the best example of such testimony. But the other statements" or "confessions" are almost as bad or worse. To concoct horrible, but conveniently vague, eyewitness accounts of mass-murder is easy. To have such tales accepted about a defeated enemy nation after a brutal war during which the vast media resources of the victors had succeeded in portraying the enemy as thoroughly depraved and wicked is also easy. On the other hand, it is not at all easy to explain how one could possibly commit mass-murder with Diesel exhaust. The fourth column from the left shows that in all of the camps except for Auschwitz, the killing operation supposedly used carbon monoxide or CO. In Auschwitz the killing operation supposedly used hydrogen cyanide or HCN. Of the five camps where carbon monoxide was supposedly used, the vast majority of victims were supposedly killed in just three camps, namely: Treblinka, Belzec, and Sobibor. It is in those three camps that the carbon monoxide was supposedly generated by Diesel engines. The numbers of Jews who were supposedly killed in Kulmhof (Chelmno) or Lublin (Majdanek) are relatively small compared to the numbers for Treblinka, Belzec and Sobibor. On the basis of the generally accepted numbers of victims, one can say that approximately half of all the Jewish victims of German gas chambers were supposedly gassed with Diesel exhaust. In other words, the Diesel gas chambers are as important, at least in terms of the numbers of alleged victims, as the gas chambers that supposedly used Zyklon B and hydrogen cyanide. In the National Broadcasting Corporation's "Holocaust" miniseries for television, which was essentially a dramatization of the generally accepted holocaust story, there were several references to the use of Diesel engines for mass-murder. In one scene, Dr. Bruno Tesch, who in real life had been a highly qualified chemist and was hanged after the war by the Allies,  explains to Eric Dorf, a fictional SS officer administering the extermination program, that one of the advantages of Zyklon B over carbon monoxide is that Zyklon B "won't clog machinery - and there's no apparatus to break down, as in carbon monoxide." In another scene Rudolf Höss, the commandant of Auschwitz, is about to start a Diesel when Eric Dorf explains to him that he will not need the Diesel anymore because he has ordered another substance, namely Zyklon B. The statement of Kurt Gerstein is still a major cornerstone of the holocaust legend in general. Gerstein was an Obersturmführer (First Lieutenant) in the SS and a mine surveyor by profession with a graduate degree in engineering. When he surrendered to the Americans, he supposedly gave them a prepared statement dated April 26, 1945 (in French, oddly enough) written partially on the backs of several receipts for the delivery of Zyklon B to Auschwitz. Since then he has been elevated to the status of "righteous gentile" by the Israelis and by various Jewish writers for having at least tried to alert the world regarding the Nazi extermination program. It was not a peephole through which Prof. Pfannenstiel supposedly looked into the gas chamber - it was a window. And it was a window in a wooden door - not a steel, gas-tight door as one might expect. Apparently, there were wooden doors on two sides of at least one of the gas chambers. We are told that the intended victims were still alive after almost three hours in the gas chambers before the Diesel even started. Surely, there must have been many air leaks into the chambers or else the Jews would have been asphyxiated without the aid of any Diesel. The men were "standing, like columns of stone with no room to fall or lean. Even in death you could tell the families, all holding hands." There is no mention anywhere of the intended victims trying to break out. Surely Prof. Pfannenstiel, with "his eyes glued to the window," would have noticed if some of the people on the other side had been trying to smash through. But no, there is no mention of anything of the sort. We are, however, told that the victims had enough presence of mind to form groups of family members and hold hands. According to the last sentence of the text quoted, "the bodies were tossed out blue, wet with sweat and urine." Here we have a flaw as far as the death-from-carbon-monoxide theory is concerned because victims of carbon monoxide poisoning are not blue at all. On the contrary, victims of carbon monoxide poisoning are a distinctive "cherry red," or "pink." This is clearly stated in most toxicology handbooks and is probably well known to every doctor and to most, if not all, emergency medical personnel. Carbon monoxide poisoning is actually very common because of the automobile and accounts for more incidents of poison gas injury than all other gases combined. The Gerstein statement, to its credit, makes no claim that carbon monoxide was the lethal ingredient in the Diesel exhaust. It is the exterminationists, i.e., the people who try to uphold the holocaust story, who have repeatedly stated that death was due to the carbon monoxide in the Diesel exhaust. The recurrence of references to "bluish" corpses in several examples of so-called, eyewitness testimony" from West German trials merely demonstrates the "copy-cat" nature of much of that testimony. That such testimony has been accepted by West German courts specializing in holocaust-related cases and by the holocaust scholars, apparently without any serious challenge, merely demonstrates the pathetic shoddiness of those trials and of the 'scholarship' pertaining to the subject in general. If the corpses had, indeed, appeared "bluish," death certainly would not have been due to carbon monoxide. A "bluish" appearance could have been an indication of death from asphyxiation, i.e., lack of oxygen. In this article we will investigate that possibility and we will see that in any Diesel gas chamber, although death from lack of oxygen is very unlikely, it is nonetheless far more likely than death from carbon monoxide. To investigate the Diesel gas chamber claim, two questions one should ask are: How much carbon monoxide is actually needed to kill a human being in half an hour? Does Diesel exhaust ever contain that much carbon monoxide? Concentration allowable for an exposure of several hours. Concentration which can be inhaled for 1 hour without appreciate effect. Concentration causing a just appreciable effect after exposure of 1 hour. Concentration causing unpleasant but not dangerous effects after exposure of 1 hour. Dangerous concentrations for exposure of 1 hour. Concentrations which are fatal in exposure of less than 1 hour. Carbon monoxide poisoning has been thoroughly studied since about 1920, when it was carefully examined in order to determine the ventilation requirements of tunnels for motor vehicles, particularly for the New York City metropolitan area in such tunnels as the Holland Tunnel. Since the early 1940s, it has been widely accepted on the basis of the research of Yandell Henderson and J.S. Haldane that an average carbon monoxide concentration of "0.4% and above," as shown on the last fine of Table 2, is the amount needed to kill people in "less" than one hour of continuous exposure. Concentrations of 0.15% to 0.20% are considered "dangerous," which means they might kill some people in one hour, especially if those people have, for example, weak hearts. But in order to commit mass-murder in a gas chamber, one would require a concentration of poison gas sufficient to kill not merely a "portion" of any given group of people, but rather, sufficient to kill "all." The vagueness introduced by Henderson's use of the term "less" is unfortunate. It arises from the fact that although Henderson and others were able to test for non-lethal effects in a laboratory with a high degree of accuracy, the lethal effects could not be tested in the same way. The lethal effects and the corresponding CO levels were determined on the basis of careful extrapolation of carboxyhemoglobin levels over time from nonlethal tests on humans and from some lethal tests on animals. Although the test results for lethal effects are not as precise as one might wish, they are nonetheless sufficiently accurate to support some important conclusions about Diesel gas chambers. Applying the same rule to the 0.15% to 0.20% which is "dangerous" for one hour of exposure, we get 0.3% to 0.4% as the amount of CO which is dangerous for half an hour of exposure. What all this means is that to have any kind of practical gas chamber using carbon monoxide as the lethal agent, one would need an average concentration of at least 0.4% carbon monoxide, but probably closer to 0.8%. We should keep "0.4% to 0.8%" in mind as benchmark numbers to which we can refer shortly. The important consideration is always the "average" concentration over the entire exposure period and not some quantity of poison measured in pounds or cubic feet. To try to analyze the problem by determining actual quantities of CO produced, rather than "concentrations," would be futile since the little that one is told, in the case of Gerstein's description, about the actual size of the chamber or chambers is so incredible to begin with. Figure 1 gives the symptoms of various low level carbon monoxide exposures as a function of time of exposure. The highest CO concentration which is discussed is 600 ppm [parts per million]. 600 ppm is another way of saying 0.06%. The chart shows that after one hour of exposure to an average concentration of 600 ppm of GO, one would experience a headache but not a throbbing headache. Even after 100 hours of exposure, the worst that one would experience would be a coma but not death. However, after only half an hour of exposure to 600 ppm, no symptoms are indicated at all - not even a mild headache. We should keep "0.06%" in mind as another benchmark number to which we will refer. T-34], but it has recently been claimed that at least one of the engines was from a Soviet submarine. Any submarine engine would certainly have been a Diesel also. In lieu of better information, one has to investigate the broader and more difficult question of whether or not any Diesel ever built could possibly have done the abominable deed. If Gerstein had claimed that the carbon monoxide was generated by gasoline engines, his story might be more credible. Gasoline engines can, indeed, kill rather easily and with little or no warning because their exhaust is almost odorless. Although Diesel engines look very much like gasoline engines, at least to most people, they are actually quite different. Any mining engineer or mine surveyor should certainly have been able to easily distinguish between the two types of engines. For one thing, the sound of Diesels is so distinct that almost anyone can with a little experience recognize them with his eyes closed. Another peculiarity of Diesels is that when in operation they usually give warning of their presence - their exhaust generally smells terrible. The intensity of the smell or stench has, no doubt, given rise to the thoroughly false impression that Diesel exhaust must therefore be very harmful. Although Diesel exhaust is not totally harmless it is, in fact, one of the least harmful pollutants anywhere except for some possible long term, carcinogenic effects which are totally irrelevant for the operation of a gas chamber to commit mass-murder. Diesel emission levels have always been within the current air emission standards of the U.S. Environmental Protection Agency without requiring any modifications or accessories. Diesels have always produced less than 1% carbon monoxide which is the current standard for internal combustion engines. Gasoline engines have only met the same standard after many years of research and after the addition of many complex accessories and engine modifications. The Diesels of the 1930s and 1940s were as clean-burning as, if not more clean than, Diesels of today. Figure 2 compares the carbon monoxide emissions from Diesel and gasoline engines. Gasoline engines are sometimes called spark ignition engines as in this figure. Clearly, the logical choice between the two types of engines as a source of carbon monoxide would always have been the gasoline engine. From spark ignition or gasoline engines, one can easily get 7% carbon monoxide, but from Diesel engines one can never get even as much as 1% with liquid fuels. An air/fuel ratio of 100, for example, means that for every pound of fuel burned, 100 pounds of air are drawn into the engine. However, only about 15 pounds of air can ever react in any way chemically with each pound of fuel regardless of the air/fuel ratio or even the type of engine. This means that at an air/fuel ratio of 100, there are always about 85 pounds of air which do not react. These 85 pounds of excess air are blown out of the engine without undergoing any chemical change at all. As far as the excess air is concerned, the Diesel engine is nothing more than an unusual kind of blower or compressor. Gasoline engines always operate with a deficiency of air. As a result of this deficiency, the reaction process in a gasoline engine can never go to completion, a relatively large proportion of carbon monoxide to carbon dioxide is always formed. Diesels always operate with an excess of air. At idle, Diesels operate with air/fuel ratios as high as 200:1. At full load, the air/fuel ratio is only down to 18:1. Because of the abundance of air, there is always far greater opportunity for the fuel to burn to completion, thereby causing very little carbon monoxide to be produced as compared with gasoline engines. Also, what little carbon monoxide is produced in the cylinders of a Diesel is subsequently diluted by the excess air. As soon as one acquires an understanding of the differences between Diesel and gasoline engines, it becomes obvious that the logical choice as a source of carbon monoxide would always have been the gasoline engine. The Diesel engine is, and always was, an inherently ludicrous choice as a source of carbon monoxide. There are basically two types of Diesel engines: divided combustion chamber engines and undivided combustion chamber engines. The divided chamber category of Diesel engines is generally subdivided into precombustion chamber designs and turbulent cell designs. Figure 3 shows a pair of emission curves for Diesels with divided combustion chambers that were the result of exceptionally careful and extensive tests made in the early 1940s in the United States by the U.S. Bureau of Mines to determine whether or not Diesel engines could operate in underground mines without endangering miners. The conclusion of the U.S. Bureau of Mines as stated in many reports throughout the intervening years has always been that Diesels may operate underground in non-coal mines subject to USBM approval of the engines and the mechanical arrangements in which the engines are employed. Figure 3: Carbon monoxide emissions for pre-combustion chamber and turbulent cell Diesel engines. The heavy vertical line at a fuel:air ratio of 0.055 has been added by the author. The lower curve in Figure 3 is for a precombustion chamber Diesel. The upper curve is for a turbulent cell Diesel. The lowest fuel/air ratio always corresponds approximately to idle and also to a no-load condition. For the pre-combustion chamber Diesel at idle, the carbon monoxide level is less than 0.02%. For the turbulent cell Diesel at idle, its carbon monoxide level is barely 0.06%. What this means is that at idle both of these types of Diesels could not produce enough carbon monoxide to even give a headache after half an hour of continuous exposure. As one starts to impose loads on these engines, thereby, in effect, increasing the fuel/air ratio's, the carbon monoxide levels actually decrease at first. Only as one approaches full load, represented by the solid heavy line in the figure, do the carbon monoxide levels rise significantly to a maximum of 0.1% at a fuel/air ratio of .055. A CO concentration of 0.1% is still well below the benchmark range of numbers, "0.4% to 0.8%." In other words, neither of these engines could possibly have produced enough carbon monoxide to kill anyone in half an hour regardless of the loads on the engines. One characteristic of Diesels is that they tend to smoke. This is not due to any inherent inefficiency of Diesels. On the contrary, Diesels are as a rule extremely efficient. The smoke is primarily the result of the nature of Diesel combustion and the heavier fuels which are used - as compared with gasoline engines. The solid heavy line in Figure 3 represents the smoke limit that manufacturers have found necessary to protect their engines from excessive wear due to smoke and solids accumulations within the cylinders. As a practical matter, a Diesel cannot be operated to the right of the solid heavy line with liquid fuels. In Figure 3 as well as in Figure 5, the solid heavy line is at a fuel/air ratio of 0.055. Many manufacturers are more conservative and limit their engines to fuel/air ratios below 0.050. Diesel engines can operate safely at fuel/air ratios greater than 0.055 only if they are burning a clean gaseous fuel; this is the only way to avoid the buildup of solid material within the cylinders. The data shown for fuel/air ratios above 0.055 were only gathered because the researchers at the U.S. Bureau of Mines chose to test the engines for theoretical reasons with gaseous fuel far beyond the normal, full load settings of the respective engines. The data for clean gaseous fuel is irrelevant to our analysis because if the Germans had had a gaseous fuel for the Diesel, they could have sent that gas directly to the gas chamber. To have used a Diesel engine as some kind of intermediate step would have made no sense at all. Such an arrangement could only have made the gas far less toxic. Since carbon monoxide is highly combustible, any carbon monoxide going into the Diesel would have been largely consumed within the engine. Diesel smoke contains a liquid phase and a solid phase. The liquid phase generally gets blown out of the engine with the exhaust and, therefore, does no harm to the engine. But if enough solid material is also produced, and rapidly enough, some of that material will accumulate in the cylinders where in just a few minutes it can severely damage the piston rings and valves and cause the engine to simply self-destruct and stop. As the graph shows, the amount of solids produced by the engines increases dramatically just beyond a fuel/air ratio of 0.055. For this reason, manufacturers as a rule equip the fuel injection pumps with stops so that the engines can only operate below 0.055 or 0.050. Operating any Diesel under any substantial load, regardless of the particular design or engine type, would have led to the production of significant amounts of smoke. Smoke is generally also noticeable immediately after start-up, even at idle or under light load, when the engine has not yet had time to reach its normal operating temperature. It should be no great surprise that there is no mention of any smoke from the Diesel - black, white, dense or otherwise - anywhere in the Gerstein statement or in any of the postwar trial testimony. Figure 5: Carbon monoxide emissions from undivided chamber Diesel engines. The heavy vertical line at a fuel:air ratio of 0.055 has been added by the author. Figure 5 shows that an undivided chamber Diesel still produces only about 0.03% carbon monoxide at idle, which is not enough to cause a headache after half an hour of exposure. However, as increasing loads are imposed on such an engine, the carbon monoxide levels do eventually rise rather sharply, and at full load, represented by the heavy vertical line, the carbon monoxide level is indeed about 0.4%. In other words, here we have a Diesel which looks as if it could have been used to commit mass-murder in half an hour. The problem for this engine, and for au Diesels, is that to operate at full load continuously for long periods, such as half an hour at a time, would involve severe risks of fouling and damage from accumulated solids inside the cylinders. If operating at lower and safer fuel/air ratios than 0.055, which would also be lower loads, the carbon monoxide emission levels drop very dramatically. For example, at 80% of full load, which is generally regarded as a safe maximum for continuous operation and which occurs at a fuel/air ratio of about 0.045, the carbon monoxide level is only 0.13%. According to Henderson's rule and index figures and some simple calculation, 0.13% carbon monoxide would not even be "dangerous" for half an hour of exposure. That Figure 3 and Figure 5 are indeed typical of all Diesel engines over the last fifty years is attested to by the fact that these particular curves have been referred to and are still being referred to in countless journals and books on Diesel emissions to this very day. In other words, there are no better examples of Diesel emissions. To be sure, there are many other test results which one can find in reputable automotive journals such as the Society of Automotive Engineers Transactions. But if one takes the trouble to look through the SAE Transactions of the last forty years, as well as through other journals, he will not find any examples of worse carbon monoxide emissions than Figure 5. Our analysis of Figure 5 represents the worst case that can be found anywhere for any Diesel engine. Aside from the smoke problem, merely to impose a full load on any engine is far from easy. For example, if one has a truck, a full load can be imposed on the engine by first filling the truck with a heavy cargo and then racing the vehicle up a steep hill at maximum speed with the accelerator to the floor. Under that condition one would probably be putting out about 0.4% from the exhaust pipe if the truck's engine were an undivided chamber Diesel. However, if the truck is parked in a driveway, it is far more difficult to impose a full load on the engine. Simply "racing" the engine with the transmission in "neutral" will put no more than a few per cent of load on the engine. Letting the clutch slip and stepping on the accelerator may impose a somewhat greater load on the engine but the clutch will rapidly burn out, jacking up the rear end of the vehicle and applying the brakes while racing the engine will impose a somewhat greater load but the brake linings will rapidly burn out. The only way to realistically impose a significant load on any engine is by attaching to the engine some kind of brake dynamometer or other loading device, such as a generator with an electrical load. Brake dynamometers could have been available and the Germans must have had many, but they are hardly the kind of equipment that one finds in the typical auto repair shop. They are generally only available in well-equipped engineering testing laboratories. They cost much more than the engines to which they are attached, since they are not mass-produced. A generator arrangement seems more plausible since places such as Treblinka and Belzec would have needed electricity, even if only to keep the barbed wire charged and the lights burning. However, such an arrangement suggests a continuous operation of both the generator and the Diesel which is contrary to the Gerstein statement. According to that statement, the engine was unable even to start for almost three hours prior to the actual gassing. There is nothing in the statement to even remotely suggest that the engine served any other purpose than to kill Jews. If it had had a dual purpose, for example, to also drive a generator, one could have expected some comment about the lights going on as the Diesel started - but there is nothing of the sort. There are other pollutants in Diesel exhaust besides carbon monoxide. These are aldehydes, nitrous oxides, and hydrocarbons, which are indeed harmful. The smell or stench for which Diesels are notorious is not caused by carbon monoxide - carbon monoxide is completely odorless. The smell is caused by trace amounts of certain hydrocarbons and aldehydes which the most modern analytical instruments can just barely identify, let alone measure. The sensitivity of the human nose to these compounds is, however, extremely high and out of all proportion to the actual quantities present. Nitrous oxides can form nitric acid by reacting with the moisture in the lungs which can, in turn, cause cancer after many months of exposure. One of the nitrous oxides formed by Diesels is tear gas, which is extremely irritating. The possible carcinogenic and mutagenic effects of nitrous oxides and certain other ingredients in Diesel exhaust may become the basis for special emission standards for Diesels in the not too distant future. All these effects are, however, long-term and totally irrelevant for mass-murder in a gas chamber. Although Diesel exhaust is relatively harmless, inhaling it is not a pleasant experience. If Diesel exhaust were introduced into a large meeting room, it would not take very long before everyone present would feel driven by an overwhelming desire to get out, regardless of how safe he or she were convinced the exhaust really was. And yet, the Gerstein-statement makes no mention of any attempt to break out of the gas chamber or even to break the "window." We are told rather that the victims formed family groups and held hands. If the Jews were not murdered with carbon monoxide from Diesel exhaust, could they have died instead from the effects of reduced oxygen in Diesel exhaust? Such a theory would at least be consistent with the claim that the corpses were "blue." A bluish coloring to certain parts of a corpse is indeed a symptom of death from lack of oxygen. This theory, however, does not hold up very well because of the fact that Diesels always operate with excess air. Figure 6: Exhaust gas constituents of internal combustion engines. The heavy vertical line at a fuel:air ratio of 0.055 has been added by the author. Normal air contains 21% oxygen. In Figure 6 we see that the oxygen concentration corresponding to idle in the exhaust of any Diesel [divided or undivided chamber], shown near the top of the chart at a fuel/air ratio of 0.01, is 18%, which is just a few per cent less than one finds in normal air. At full load, which corresponds to a fuel/air ratio of 0.055, the oxygen concentration in the exhaust of any Diesel is 4%. According to Haidane and Priestley, "air containing less than 9.5 per cent of oxygen would ordinarily cause disablement within half an hour." Disablement is still not death. It is clear that there is no magic number below which death would occur, or above which life would continue. However, for any gas chamber relying upon reduced oxygen as the killing method, one would have to reduce the oxygen to below 9.5% perhaps even below 6%. From Figure 6 we see that to reduce the oxygen concentration in the exhaust to just 9%, any Diesel would have to operate at a fuel/air ratio of about 0.040, which corresponds to about 3/4 of full load. To reduce the oxygen concentration to as low as 6%, which would be the fourth stage according to Henderson and Haggard and would almost certainly be the condition needed to kill "all" members of any intended group of victims, any Diesel would have to operate at a fuel/air ratio of about 0.048, which is close to full load. In other words, any Diesel gas chamber relying on the reduction of oxygen as a killing method would have to operate at more than 3/4 of full load, but probably closer to full load. From the above it should be obvious that over most of their operating ranges, Diesels discharge sufficient oxygen so that one can literally inhale pure Diesel exhaust and survive on the oxygen in the exhaust. From idle to at least 3/4 of full load, Diesel exhaust contains sufficient oxygen to sustain human life for at least half an hour. If the Jews were not killed with carbon monoxide or from a lack of oxygen, could they have died instead from the effects of carbon dioxide? Carbon dioxide is not really any more poisonous than ordinary water. Most toxicology handbooks do not even mention it. When mentioned at all, it is generally classified as a "non-toxic, simple asphyxiant." There are occasional accidental fatalities where carbon dioxide is directly involved. Death in almost all such cases is caused by a lack of oxygen. The lack of oxygen is caused by the fact that the carbon dioxide is much heavier than oxygen and will, especially in an enclosed space, displace oxygen in the same way that water will displace air in the lungs of a drowning man. The cause of death, chemically, in both situations is not carbon dioxide but rather the lack of oxygen in the blood. One symptom of this kind of death is a bluish appearance of the skin. Carbon dioxide can be beneficial and therapeutic. It is commonly used in clinical medicine as a harmless stimulant for respiration, for which purpose it is supplied under pressure in cylinders [Carbogen] containing oxygen and 7% carbon dioxide. Normally, when a person exhales, the air leaving the lungs contains about 5.5% carbon dioxide. For Diesel engines, the carbon dioxide level at or near idle is only about 2% and gradually increases to about 12% at full load as shown in Figure 6. A carbon dioxide level of 12% may cause cardiac irregularity and may, therefore, be dangerous for people with weak hearts. Gasoline engines, in contrast to Diesels, produce 12% already at idle. In general, if enough oxygen is available, a carbon dioxide level even as high as 12% is not likely to cause death. However, when the carbon dioxide level is this high in Diesel exhaust, the corresponding oxygen level is dangerously low. The principal danger to life from Diesel exhaust arises not from the abundance of carbon dioxide, nor even from carbon monoxide, but rather from the lack of oxygen. If the exhaust pipe from a Diesel engine is connected to a gas chamber, the carbon monoxide concentration will initially be extremely low and the oxygen level will initially be high. [Since the doors of a gas chamber must be opened to allow the intended victims to enter, fresh air must enter the chamber also.] As soon as the Diesel starts and as more and more Diesel exhaust is introduced into the chamber, the carbon monoxide concentration will gradually rise to the level directly inside the exhaust pipe of the Diesel engine without ever being able to exceed that level. Exactly how long it would take before the oxygen and carbon monoxide levels in the gas chamber equal the levels in the engine exhaust pipe is impossible to determine in the case of the Gerstein account because the information about the engine and gas chamber is so limited. To got a better idea as to how effective - or ineffective - a Diesel gas chamber such as that described by Gerstein might have been in practice, we can analyze the problem by dividing the half-hour into two periods: a period of "rising CO concentration" followed by a period of "constant CO concentration." Since we do not know the size or rpm of the engine, or the size of the chamber, or the amount of leakage into or out of the chamber, we cannot possibly determine the actual duration of each of these two periods. Nonetheless, we do know that when they are added together, the sum must equal half an hour. For the "constant period," the deadliest arrangement would use an undivided chamber Diesel which could give a carbon monoxide concentration as high as 0.4%. For the "rising" period, the carbon monoxide concentration would be near zero initially and no more than 0.4% at the end. When we average these two numbers together, we get a maximum, average concentration for the "rising" period of 0.2% assuming a steady rise in carbon monoxide. The combined average over the entire half-hour cannot be determined precisely because we simply do not know the duration of the "rising" and "constant" periods respectively. But we can be sure that it would always be some number less than 0.4%. If the "rising" period had only been of short duration, the combined average for half an hour would be only slightly less than 0.4%. If the "rising" period had been longer, the combined average would be lower. If the "rising" and "constant" periods had each lasted for fifteen minutes, the combined average concentration for the entire half hour would be less than 0.3%. According to our previous analysis of toxic effects, 0.3% of CO [for half an hour] is only "dangerous" which means that it could have killed no more than a portion of any group of intended victims. Without knowing the type and size of the engine, and the amount of leakage into the gas chamber, we cannot possibly determine the exact carbon monoxide concentration in the gas chamber. We do know, however, that the average would always be less than 0.4%. It would always be less than the benchmark number which was established previously as the minimum amount required in the Gerstein-Diesel gas chamber. In other words, the carbon monoxide from any Diesel ever built would by itself never have been able to kill more than a portion of any group of intended victims even if the Diesel were of the undivided chamber design and even if it were operated at full load. A similar analysis of the effects of reduced oxygen would show that one would have had to operate any Diesel ever built at some indeterminate level above 3/4 of full load before the arrangement could have been even marginally lethal due to lack of oxygen. An analysis of the combined effects of carbon monoxide, carbon dioxide and reduced oxygen might be possible on the basis of the research of Haldane and Henderson, but it would not give any significantly different results than what has already been concluded on the basis of reduced oxygen acting alone. The reason is that the carbon monoxide and carbon dioxide levels are just too low to make much difference. In any event, any Diesel ever built would have had to operate at a minimum of 3/4 of full load in order for the Diesel gas chamber to have been even marginally effective from any possible combination of toxic effects. In addition to their smoke and smell, Diesel engines are also notorious for their intense noise and vibration. Because of their higher compression ratios, lower rpm's, and the type of combustion, the amount of vibration that Diesels produce is substantially greater than that of any comparably sized gasoline engines. The noise and vibration are among the major reasons why Diesels have not generally been used in automobiles. If the 12 cylinder, V-type Diesel engine from a typical Soviet T-34 tank with a rated capacity of 500 HP had been mounted on the floor of a small building and had been operated for half an hour at more than 3/4 of full load, i.e., at more than 375 HP, the noise and vibration would have been at least as noteworthy and as wildly spectacular as the wailing of any Jews - and yet, there is no mention of any such noise or vibration in the Gerstein statement or in any of the postwar trial testimony. Without some understanding of the basic characteristics of Diesel engines, the method that would have come to mind most readily for any would-be mass-murder would have been to simply mount a Diesel on the floor of a building and direct the exhaust into some adjoining rooms without any provision for artificial load on the engine. Such an arrangement would have annoyed the hell out of any group of intended victims, but would have given them nothing worse than a headache. The headache would have been due to the stench and smoke and noise but certainly not to carbon monoxide or lack of oxygen. As a method for committing mass-murder, it would have been a fiasco. For any Diesel arrangement to have been even marginally effective for mass-murder would have required an exceptionally well-informed collection of individuals to know and do all that was necessary. They would have had to be familiar with the carbon monoxide and oxygen emission curves for their particular engine. Such information is probably not known even today by most engineers, despite all the popular concern over air pollution. The gas chamber designers would also have had to know how to impose and maintain an engine load of more than 3/4 of full load on their engine since anything less would just not have been enough. If they had overloaded the engine or operated it for too long at or near full load [more than 80% of full load is generally considered unsafe for continuous operation], they might after each gassing have had to overhaul and, perhaps, replace the engine because of fouling and damage from engine smoke. Merely to gather and properly assemble the appropriate equipment, including the equipment for imposing and controlling an artificial load, would have been a major undertaking which would have required the expertise of experienced engineers, not just ordinary auto mechanics. The mounting of the engine on the floor of the building would have required a proper foundation with some provision to isolate vibrations so as to avoid tearing the building apart. The all-important question is: if any persons had been smart enough and resourceful enough to know and do all that was necessary to make a workable Diesel gas chamber, why would they have bothered to try to use a Diesel engine in the first place? For all their efforts they would have had a gas chamber which at the very worst would still have been only marginally effective at its morbid task. For all their efforts they would have had an average concentration of less than 0.4% carbon monoxide and more than 4% oxygen. Any common, ordinary gasoline engine without any special attachments would easily have given them ten times as much carbon monoxide at idle as any comparably sized Diesel at full load. Any common, ordinary gasoline engine would easily have given them 7% carbon monoxide and less than 1% oxygen. If one had tampered with the carburetor, one could probably have had as much as 12% carbon monoxide by merely turning one small screw, namely the idle-mixture adjustment screw. Comparing the two types of engines, with both operating at idle or under light load, the difference is even more dramatic. At idle or under light load any common, ordinary gasoline engine without any special attachments would easily have given more than one hundred times as much carbon monoxide as any comparably sized Diesel. The Diesel gas chamber story is incredible on these grounds alone. However, the story becomes even more incredible when one discovers that far better sources of carbon monoxide, better even than gasoline engines, were readily available to the Germans. Those other sources did not require either Diesel fuel or gasoline. During World War II all European countries relied for most of their non-military vehicular transport needs upon vehicles which burned neither gasoline nor oil, but burned solid fuels such as wood, charcoal, or coal instead. The solid fuel, which was generally wood, was first converted into a mixture of combustible gases by burning in a generator, usually mounted at the rear of the vehicle. The gases were then withdrawn from the generator and burned in a modified gasoline or Diesel engine located at the front of the vehicle. The combustible gas produced in this way always contained between 18% and 35% carbon monoxide. 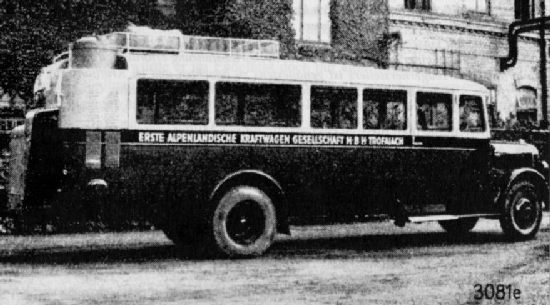 In German-speaking parts of Europe, the producer gas vehicles were called "Gaswagen." If they burned wood, which most of them did, they were generally called "Holzgaswagen," which literally translated means "wood gas wagons." The abundance of the gaswagons throughout German-occupied Europe and the intensity with which the Germans were developing ever newer vehicles and applications of the producer gas technology is a fact which undermines the holocaust story in general. Had the Germans ever intended to commit moss-murder with carbon monoxide, they certainly would have employed the producer gas technology long before they would have ever used anything as idiotic as Diesel exhaust. Surely, Eichmann and the other "transportation experts" involved with the "final solution of the Jewish problem," which was to a great extent a transportation problem, would have been well aware of these vehicles and of their unique features. Surely, they would have used the "gaswagons" to kill the Jews had there ever been any intent to kill the Jews with poison gas. The gaswagons, which would have been far superior for mass murder to any conventionally powered vehicles, including the "gas vans," traveled on all the roads of Europe and into and from the concentration camps daily. And yet, these potentially perfect mass-murder devices have never been implicated by the promoters of the holocaust story in even a single murder! The gas van story is merely an adaptation by the holocaust propagandists of some documentary materials related to the perfectly innocent use of producer gas vehicles, supported of course by appropriate "eyewitness" testimony generated after the war. It is within the gas van story that one clearly sees in miniature the evolutionary process of the larger, general holocaust story. In addition to the producer gas technology, the Germans had the world's most advanced coal gasification technology. One of the first steps in most of the coal gasification processes was to produce carbon monoxide from coal. The carbon monoxide could then be used either as a fuel or as an intermediate step in the synthesis of other products. Because of Germany's isolation from adequate sources of petroleum and natural rubber, she had converted much of her industry already during World War I to use coal as a substitute source of hydrocarbons for making synthetic liquid fuels as well as a vast assortment of chemical substances, including synthetic rubber. The quantities of carbon monoxide that were produced as part of this technology measured in the millions of tons and would have been more than enough to kill the entire population of Europe many times over. Coal gasification plants were located in all of Germany's industrial areas. One region containing several such plants was Silesia, where the abundance of coal had for more than a century been the basis of that region's industry. One Silesian facility was the I.G. Farben plant at Auschwitz, a small portion of whose carbon monoxide could easily have been diverted through a small pipeline to Auschwitz-Birkenau only a few miles away. Of course, no one alleges that carbon monoxide was ever used for mass-murder at Auschwitz although that would have been an ideal place for it. For mass-murder at Auschwitz, the Germans supposedly used a completely different substance, Zyklon B. Although it would be most convenient for the revisionist camp in the holocaust controversy to be able to say that mass-murder could not possibly have been committed with Diesel exhaust in half an hour, that simply cannot be said with total accuracy. It must be conceded that it would have been remotely possible to commit the deeds in question with Diesels. However, it would certainly have required an inordinate amount of expertise and determination and, for all their efforts, the would-be murderers would have had an arrangement which at best [worst?] would still have been only marginally effective at its morbid task. From a practical perspective the whole idea of perfecting a Diesel arrangement for such a purpose would have been contrary to all common sense. One is sometimes told in the Holocaust literature that the reason the Germans used gas chambers to murder the Jews was to avoid the emotional strain on soldiers who would have otherwise had to kill the Jews by shooting them by the thousands. It is suggested that the gas chamber method was more efficient somehow. No doubt, an efficient killing method could have been developed - but not with Diesel exhaust. From all the evidence we have seen regarding Diesel exhaust and its effects, a more hideously clumsy, and inefficient, method of committing mass-murder would be hard to imagine. Although it is conceivable that some deranged minds may have tried for a time to commit murder with Diesel exhaust, after a few tries it would have become apparent to even the most demented fiend that something better was needed. And yet, Christian Wirth supposedly asked Gerstein not to propose in Berlin any other kind of gas chamber. Supposedly, it was not just a few people who were killed with Diesel exhaust, but millions. To have used such a clumsy method to kill Jews, especially when far better methods were readily available, is incredible enough, but that the same clumsy method would have also been used by the Germans on their own people as part of a euthanasia program is even more incredible. Postscript: More Surprises to Come! A marvelous metamorphosis is already taking place in the holocaust story. Several leading Holocaust proponents are now taking great pains to drop the Diesel claim and replace it with the view that the engines were not Diesels but conventional gasoline engines which simply burned Diesel fuel, presumably to make the engines more deadly than if they had only burned regular gasoline. This amazing transformation has appeared in a recent book in Germany entitled Nationalsozialistiche Massentötungen durch Giftgas. The book was a joint project of 24 of the most eminent scholars on the subject, including such notables as Eugen Kogon, Hermann Langbein, Adalbert Rückerl, Gideon Hausner, Germaine Tillion and Georges Wellers. The book represents the current state of the art of holocaust mythomania and has already been recommended by the World Jewish Congress in London. The new, "revised" version of the holocaust says, in effect, that Gerstein and others were mistaken when they had claimed that Diesels were used to kill Jews at Treblinka, Belzec and Sobibor. The claim now is that gasoline engines were used. The clumsy juggling of evidence which characterizes this book is exemplified by the fact that although the Gerstein statement refers to Diesel engines four times, the portion of the Gerstein statement which is quoted in this supposedly definitive rebuttal of the revisionists does not mention Diesels at all, nor does it even describe the alleged killing process. For a description of the killing process that Gerstein supposedly witnessed, the book gives a piece of postwar testimony by Dr. Pfannenstiel in which there is also no mention of the use of Diesels, but only of the use of Diesel fuel in the engine. How one could possibly have operated a gasoline engine with Diesel fuel is, of course, left to the imagination. The fact is that any gasoline engine simply would not operate with Diesel fuel [and vice-versa]. That the Gerstein statement, although in a severely abbreviated form, is included at all in such a scholarly work, despite the problems for the "revised" version of the holocaust story which should be obvious to anyone looking at the complete text of that statement, only shows how desperate the holocaust scholars are to scrape together everything they have in support of their monstrous fantasy. They have precious little, and the Gerstein statement is still the best evidence they can present. The "gas chambers" that one is shown today in Dachau, Auschwitz and elsewhere are practically nothing more than ordinary rooms which could not have been used to kill in the manner alleged. The Diesel gas chambers in Treblinka. Belzec and Sobibor were all supposedly destroyed long before the end of the war. Raul Hilberg. The Destruction of the European Jews [Chicago: Quadrangle Books, 1961]. p. 572. It was at these camps that many photos were taken of dead bodies, many already in advanced states of decay. These photos are still being presented as proof of Jewish extermination. No comparable photos were taken in Auschwitz, for example. Already in 1960 Dr. Martin Broszat of the Institute for Contemporary History in Munich wrote in a letter to Die Zeit [19 August 1960], p. 16, stating that there had been "no gas chambers in the Altreich," meaning Germany within its pre-1937 borders, but rather "gassings took place only in German-occupied Poland." The exclusion of Dachau, Bergen-Belsen and Buchenwald from the current litany of extermination camps in the serious literature is a tacit admission that at least a "mini-hoax" had been perpetrated earlier. William B. Lindsey, "Zyklon B, Auschwitz, and the Trial of Dr. Bruno Tesch," Journal of Historical Review Vol. 4, No. 3 [Fall 1983]. In a trial in France in 1982 in which Dr. Robert Faurisson had been sued for slander by Poliakov for having described him as a "falsifier of history," Poliakov had explained that he had simply misread a poor quality copy of a copy, several times removed, of the original Gerstein document. Leon Poliakov, Harvest of Hate, Holocaust Library [New York: Schocken Books, 1979], p. 195. Dr. Wilhelm Pfannenstiel was a professor at the Institute for Hygiene at the University of Marburg an der Lahn. An article by him on the effectiveness of vitamin K was published in Deutsche Zeitschrift für Chirurgie, 257 Band  pp. 639-42. Also, an answer by him to a reader's question was published by the Münchener Medizinische Wochenschrift [4 July 1941], p. 766, with his home address: Pilgrimstein 2, Marburg an der Lahn. He was apparently sent to Belzec as well as other camps as a medical consultant to improve camp sanitation. After the war he was interrogated every few years with regard to his visit to Belzec with Gerstein and on two occasions was prosecuted, the last trial being in April 1970 in Marburg. Essentially, his testimony was always to support the Gerstein statement while at the same time avoiding or denying anything which would incriminate himself. S. Kaye, Handbook of Emergency Toxicology, 4th ed. [Springfield: C.C. Thomas, 1980] pp. 187-88. For a more detailed discussion of toxic effects of CO see: C.J. Polson & R.N. Tattersall, Clinical Toxicology [Philadelphia: Lippincott, 1969], pp. 604-21. Y. Henderson and H.W. Haggard, Noxious Gases [New York: Reinhold Publishing, 1943], p. 168. W. Baker and A.L. Mossman, Effects of Exposure to Toxic Gases, [East Rutherford, New Jersey: Matheson Gas Products, 1970], p. 12. P.S. Myers, "Automobile Emissions - A Study in Environmental Benefits versus Technological Costs," Society of Automotive Engineers Transactions Vol. 79 , Section 1, paper 700182, p. 662. A Russian submarine engine is mentioned, without any details, in Jochen von Lang, Eichmann Interrogated [New York: Farrar, Straus & Giroux, 1983] p. 76. Since World War I, gasoline engines have as a rule been excluded from submarines because of the toxicity of their exhaust and the flammability of their fuel. Thus, any submarine engine, even from a Soviet submarine, would have been a Diesel and would probably have been as powerful as the engine from any tank. David F. Merrion, "Effect of Design Revisions on Two Stroke Cycle Diesel Engine Exhaust," Society of Automotive Engineers Transactions Vol. 77 , paper 680422, p. 1535. Figure 3 and Figure 5 have been used repeatedly over the last forty years in the technical literature by numerous engineers thereby demonstrating the reliability of the data on which these figures are based and the extent to which they represent the worst possible carbon monoxide emission levels from all Diesels. Two of the early examples of articles using Figure 3 are: H.H. Schrenk and L.B. Berger, "Composition of Diesel Engine Exhaust Gas," American Journal of Public Health Vol. 31, No. 7 [July 1941], p. 674, and Martin A. Elliott, "Combustion of Diesel Fuel," Society of Automotive Engineers Quarterly Transactions Vol. 3, No. 3 [July 1949], p. 509. Although the related tests and their purpose have been discussed in many articles, probably the best is in Holtz. Elliot and Davis, "Composition of Diesel Exhaust Gas," SAE Quarterly Transactions Vol. 4, No. 3 [July 1950], pp. 345-46-discussion by E.W. Landen. Edward F. Obert, Internal Combustion Engines and Air Pollution [New York and London: Intext Educational Publishers, 1973], p. 361. Henderson & Haggard, pp. 144-45. J.S. Haldane & J.G. Priestly, Respiration [New Haven: Yale University Press, 1935], pp. 223-24. L.J. Meduna, Carbon Dioxide Therapy [Springfield: C.C. Thomas], pp. 3-19. J.D.P. Graham, The Diagnosis and Treatment of Acute Poisoning [London: Oxford University Press, 1962], pp. 215-17. L.T. Fairhall, Industrial Toxicology, 2nd ed. [Baltimore: Williams & Wilkins, 1957], p. 180. Wolfgang Oerley, "Entwicklung und Stand der Holzgaserzeuger in Österreich, März 1938 [Development and Status of Woodgas Generators in Austria, March 19381," in ATZ Automobiltechnische Zeitschrift, Heft 11 [April 1939], p. 314. Before the war, the leading company not only in Europe but probably in the entire world in the manufacture and development of "wood gas wagons" was the Vienna-based Saurer Company. This is the same company which is identified, oddly enough, as the manufacturer of the murderous "gas vans" in PS-501. The German automotive technical literature of that period abounds with material on this forgotten subject. For an introductory survey of the subject, two especially useful issues of ATZ are Heft 18 from September 1940 and from 1941. Rauff is now residing in Chile where he is pursued by the likes of Simon Wiesenthal and Beate Klarsfeld - A recent attempt by the ADL in the U.S.A. and by others to have him extradited to Israel was denied by the Chilean government because of Chile's statute of limitations and because of Rauff's faultless behavior in Chile. A more thorough analysis of the gas wagons, and of Zyklon B, may be found in the author's taped presentation given in Los Angeles on 6 September 1983 before the International Revisionist Conference of the Institute for Historical Review, from which this article is essentially an abridgement. The audio cassette is available from the Institute. An excellent discussion of the subject including extensive lists of references, especially German references, is: W. Gumz and J.F. Foster of the Battelle Memorial Inst., "A Critical Survey of Methods of Making a High BTU Gas from Coal," Research Bull. No. 6 [New York: American Gas Association, July 1953]. See the complete text of the Gerstein statement in Arthur R. Butz, The Hoax of the Twentieth Century [Torrance, CA: Institute for Historical Review, 1982] p. 254. The extermination technology employed at Treblinka, Belzec and Sobibor was supposedly no longer an experimental technology in 1942 but rather a highly developed technology based upon almost three years of practical experience beginning in 1939 with the euthanasia program. Nationalsozialistische Massentötungen durch Giftgas [National Socialist Mass- Murders with Poison Gas] [Frankfurt: S. Fischer Verlag, 1983]. Chicago Jewish Sentinel [22 December 1983]. Nationalsozialistische Massentötungen durch Giftgas, p. 172-74. See, for example, his testimony before the Darmstadt court from 6 June 1950 which appears in Saul Friedländer, Counterfeit Nazi: The Ambiguity of Good [London: Weidenfeld and Nicolson, 1967], p.18. For a thorough discussion of the kind of mad dilemma confronting any German who was even remotely connected with the concentration camps - Treblinka, Belzec and Sobibor were actually transit camps rather than concentration camps - see the article by W.B. Lindsey. Source: Reprinted from The Journal of Historical Review, vol. 5, no. 1, p. 15-46.